The outer body surrounds the internal structure and mechanical parts, protecting them from impact and eliminating potential repair costs from scrub decks being exposed outside the body. Parts that should be cleaned daily are color coded in yellow. 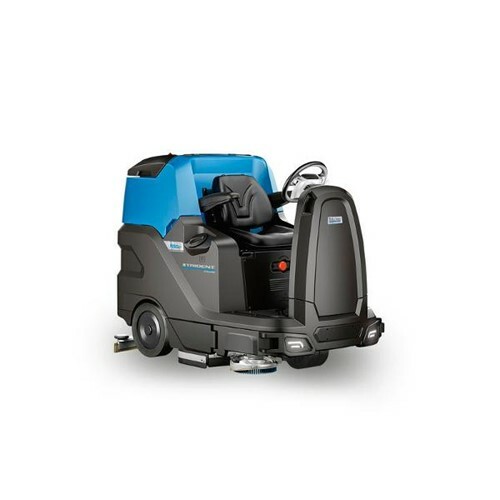 This saves time and makes sure your scrubber is kept in perfect condition at all times. Ergonomically designed, adjustable padded seat delivers hours of stress-free operation. The operator can position the seat for maximum comfort and safety. The R36 Series combines the strength of steel and state-of-the-art aluminum to deliver an under-carriage built for performance. The key aluminum components are corrosion resistant, sturdy and durable, light weight and provide a precision fit. The third brush moves laterally to facilitate cleaning along walls or shelves, increasing productivity by up to 15%. Electronically controlled pressure setting tackles even the most stubborn soils by applying up to 330 lbs. of brush pressure. Self-adjusting hydraulic drum brakes deliver the best braking performance. One-Touch - Service On Site - One-touch service contact in case of emergency. Pushing the red button will automatically send an e-mail to the authorized Hillyard service department on record so they can quickly act on the request. Automatic Electro Braking - Automatically operated safety break engages when the machine stops. It acts as a safety parking brake. Brush RPM (Central/Side): 180/140 RPM/Min. Productivity: 58,000 Sq. Ft/ Hr.